A black and white photograph of 300 Gordon Street. 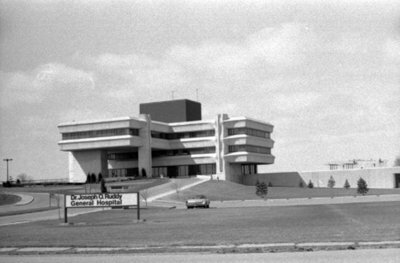 The Dr. Joseph O. Ruddy Hospital was built from 1967 to 1969 and was officially opened by Ontario Premier John P. Robarts on May 14, 1970. It served as a general hospital until 1993 when it became part of the Lakeridge Health System, offering specialized treatments and a continuing care ward. The hospital was originally named after Dr. Joseph O. Ruddy (1900-1969) who worked for 25 years to establish a general hospital in Whitby. Winter, Brian ; Ruddy, Joseph O. ; Robarts, John P.
300 Gordon Street, April 1976, Brian Winter. Whitby Archives A2013_004_017B.